A note about "First Flight Covers" - Most of the covers you see described as First Flight Covers are covers that commemorate a first flight by a new airmail service, usually by the application of a special cancel. They have not necessarily been transported aboard an inaugural flight although sometimes this is the case, if so, they will show the correct airmail postage rate. The Airmail routes between Japan and Manchuria, that would eventually become so important for Manchukuo took time to establish and this was done by a series of trial or experimental flights. These Japan Air Transport Co. flights were aimed at testing airfields, refuelling facilities and mail handling from airport to post office ahead of the establishment of a regular service in April 1929. Most of the test mail was philatelic. 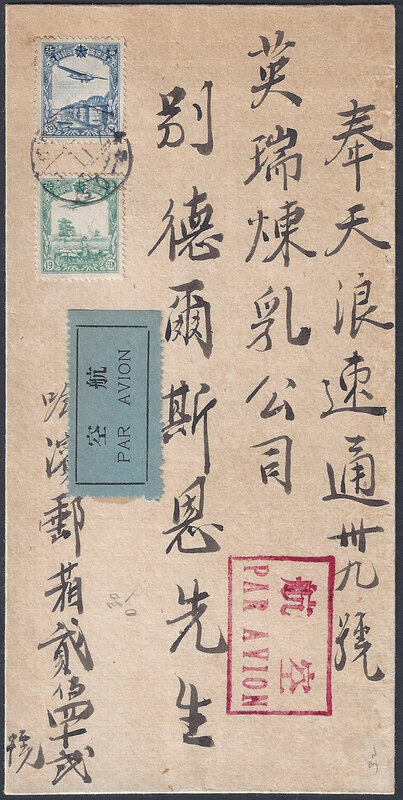 This 1½ sen postcard was sent on a trial service between Dairen and Osaka via Kiejō (Seoul), a total distance by air of 2,109km. A stop for refuelling was made at Tachiarai military Airfield outside Fukuoka. The trial ran from 13th September to 14th November 1926 later flights carried some normal mail at standard prices (1½ sen postcards and 3 sen letters). The above card is not a "First Flight" example being dated 20th September, posted from Dairen. The special cancel was only used in Dairen and not repeated in Japan and Korea. The above card has a red boxed 飛行 (Hikō) "Airmail" hand stamp but lacks an arrival date stamp, the address is unreadable (by me). 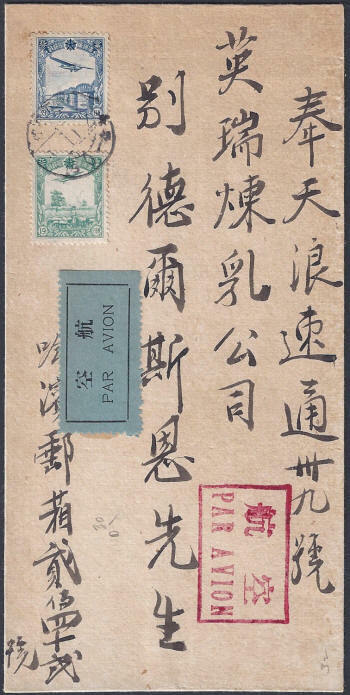 This is a philatelic postcard sent on an experimental Japanese postal flight linking Kiejō (Seoul) with Mukden in Manchuria. The card would have travelled on one of a series of flights that took place between 12th August and 15th November 1927. The most striking postal marking is the violet, aircraft shaped commemorative date-stamp. The lower wing indicates the date of posting and reads 2.9.27 this is 27th September 1927. 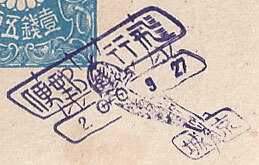 The upper wing reads 飛行郵便 (Hikō Yūbin) "Airmail" (the character 行 Gyō being made up by doubling the sign "〒" emblem of the Japanese Postal Service). 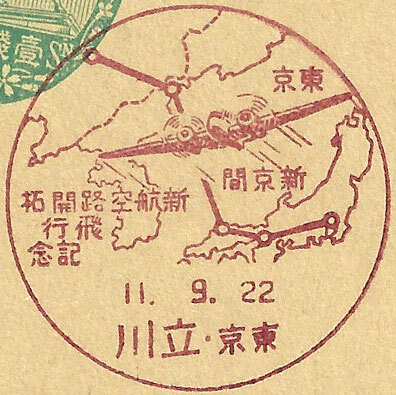 Lastly, the tail of the aircraft has the characters 京城 Kiejō (now Seoul) showing the originating postal town. Japan established an airmail service between Dairen and Japan on 1st April 1929 (see the covers below) and in December 1931 the Japanese are reported to have set up a regular airmail service to Japan, flying from Mukden. The Chinese complained about this unauthorised service in a Memoranda sent by the Chinese Assessor to the Commission of Enquiry established by the League of Nations. 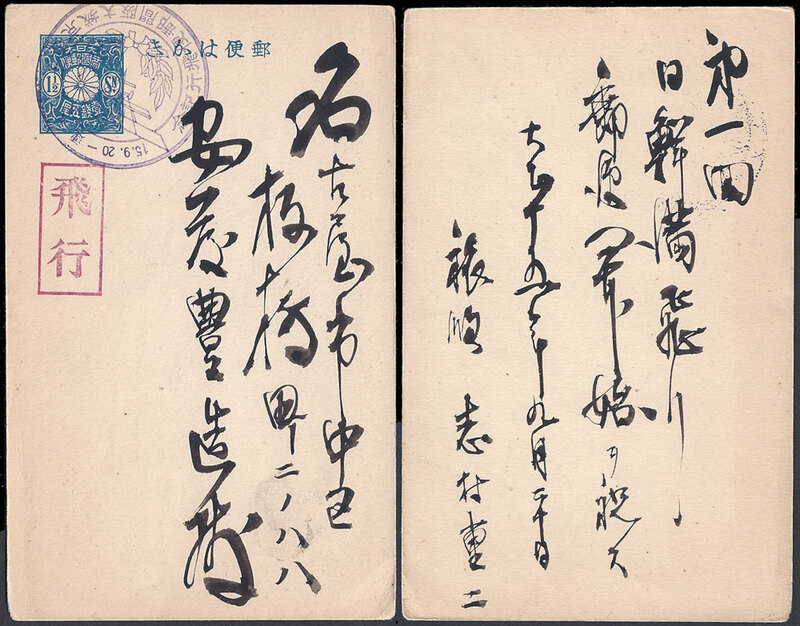 1st April 1929 Dairen to Matsuyama, Japan. This item may have been part of a special batch of covers issued for collectors. 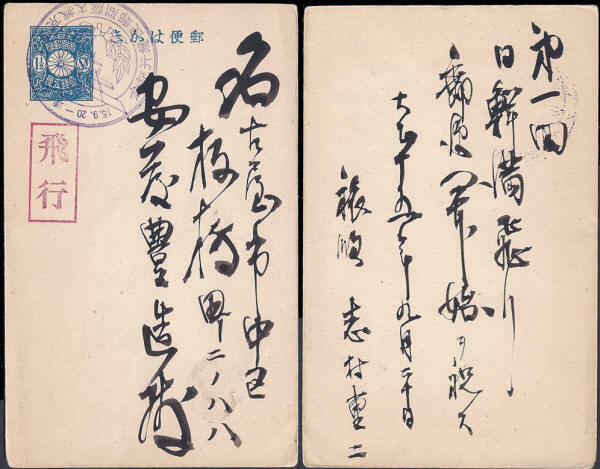 The special cancel shows that the cover left Dairen on 1st April 1929 and the arrival cancel indicates that it reached 松山 Matsuyama on 2nd April. The postage of 3 sen was the standard domestic letter rate at this time and would have been insufficient for an airmail letter. 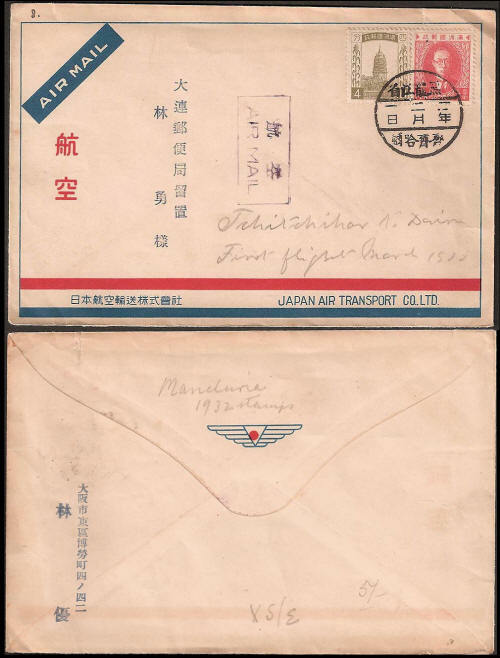 Note - The Japanese Post Office specified that all airmail must be marked 航空 or AIR MAIL to qualify for this service, this cover demonstrates both options. 1st April 1929 Dairen to Chicago, U.S.A. This item is likely to be a privately arranged cover. The postage of 3 sen is grossly insufficient so it is likely a collector simply took it to a post office to be cancelled, while it was there the postal staff probably struck out the address in blue pencil but applied the cancels carefully and the "sender" returned home with it. 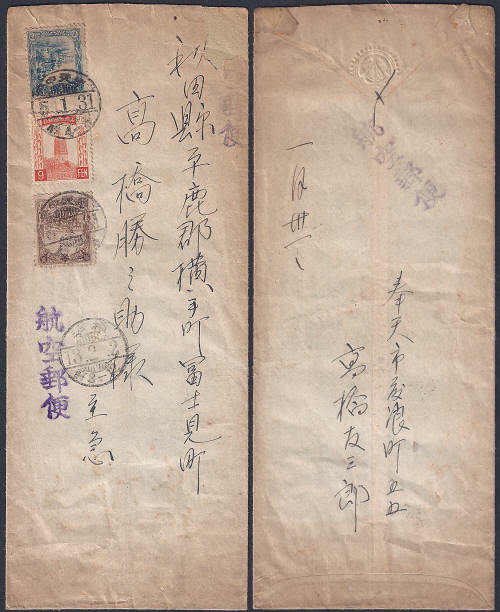 2nd April 1929 Dairen to Ōsaka, Japan. This is a special First Flight Postcard issued for collectors. 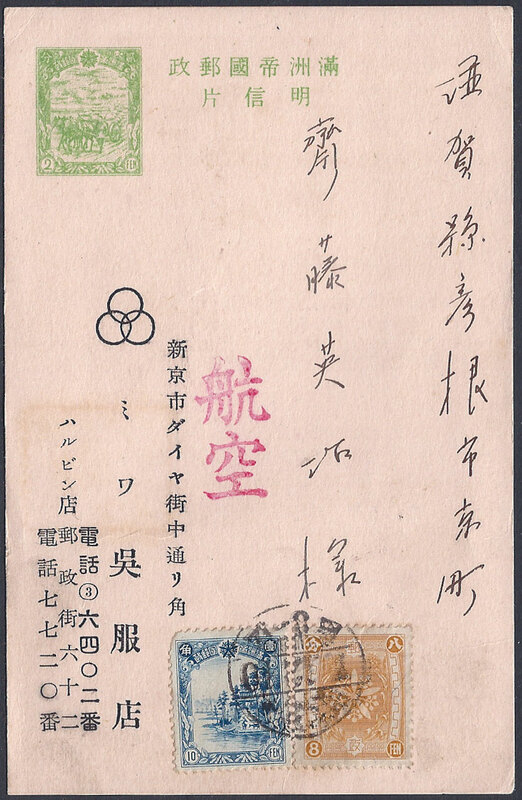 The special cancel shows that the cover left Dairen on 2nd April 1929 and the arrival cancel indicates that it reached 大阪 Ōsaka on 5th April. 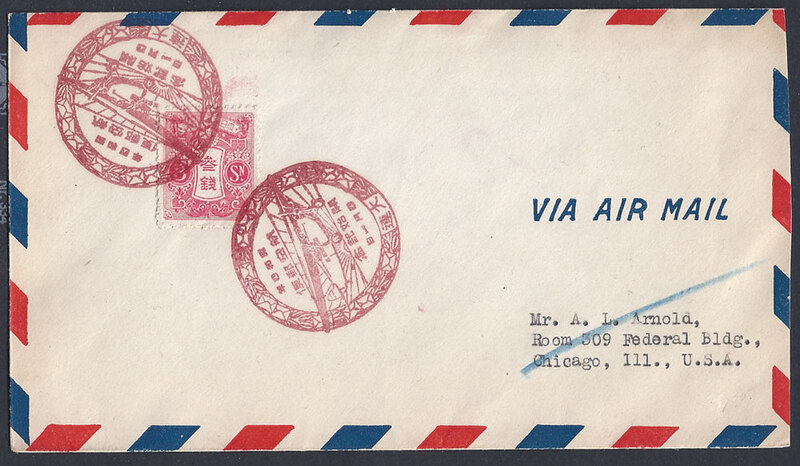 The postcard carries 8½ sen, this was the correct air-mail rate for a postcard on this route. The card shows the route; 1. 東京 Tōkyō, 2. 大阪 Ōsaka, 3. 堺 Sakai, 4. 高松 Takamatsu, 5. 大分Ōita, 6. 福岡 Fakuoka (Tachiarai airport), 7. 京城 Keijō (Seoul), 8. 大連 Dairen. In October 1932 the Manchuria Air Transport Company (M.A.T.C.) was formed with support from the Government of Manchukuo, The South Manchuria Railway Company and the Sumitomo Company of Japan. M.A.T.C. enjoyed a monopoly as other companies were excluded from providing air transportation in Manchukuo. When the service started it relied upon the Fokker Super-Universal, single engine, high wing, monoplane, this had been a workhorse of the Japanese mail service. These aircraft carried passengers together with freight and mail. 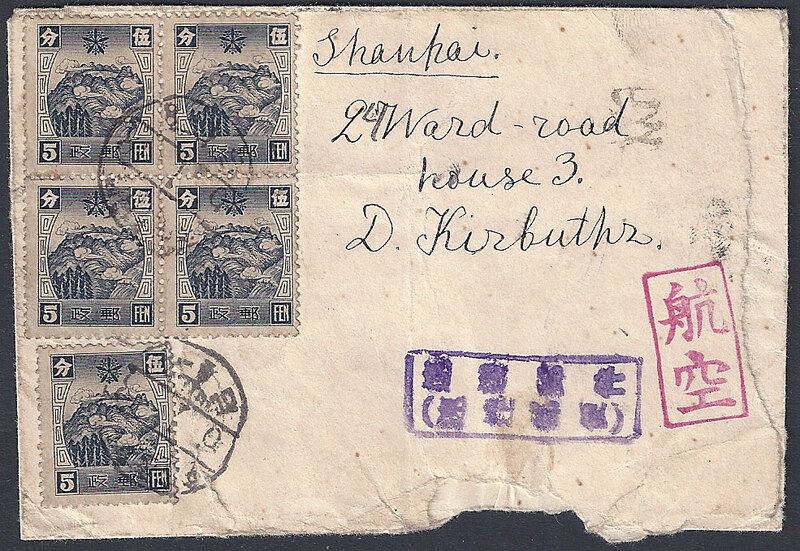 This cover is dated 3rd November 1932 and travelled from Tunhua to Kirin where the black arrival cancels show it was delivered on 5th November 1932. 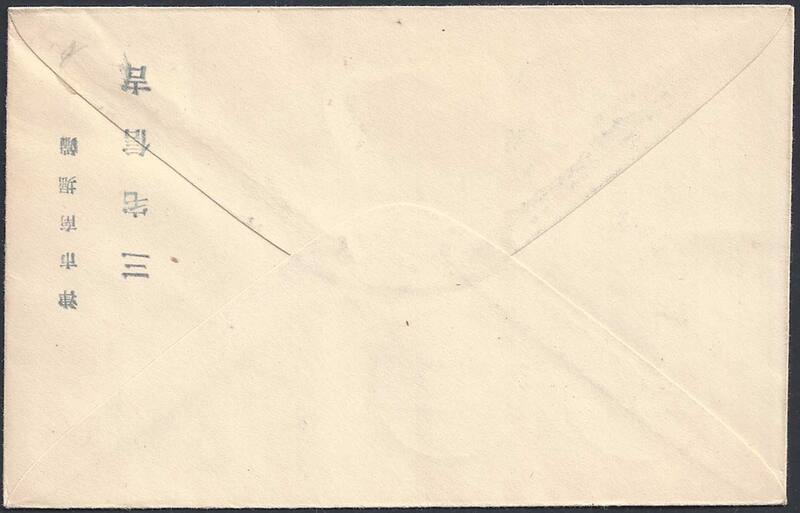 The cover is clearly marked Registered Airmail and carries the remnant of a registration slip. The stamp value of 25 fen is correct 19 fen for an airmail letter plus 6 fen for registration. 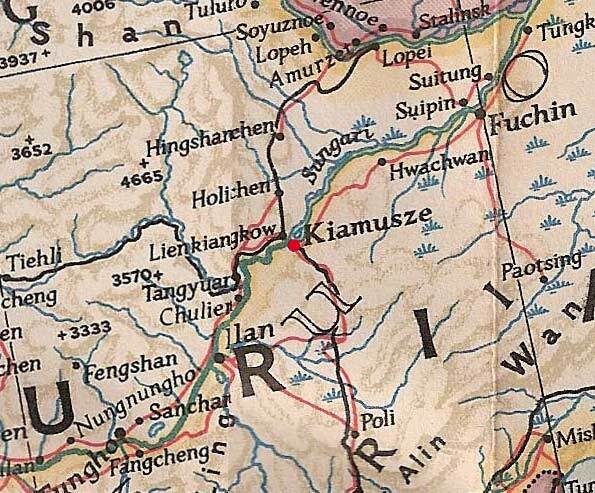 7th November 1932 Tsitsihar to Tokyo. 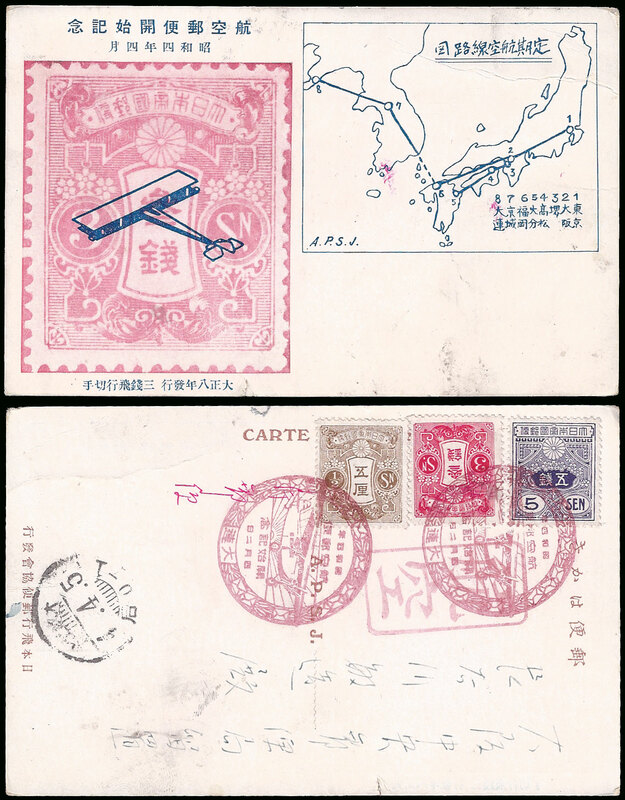 The above example is an Airmail Cover sent before the introduction of special airmail stamps with the correct postage to Japan - normal mail 4f plus 30f. 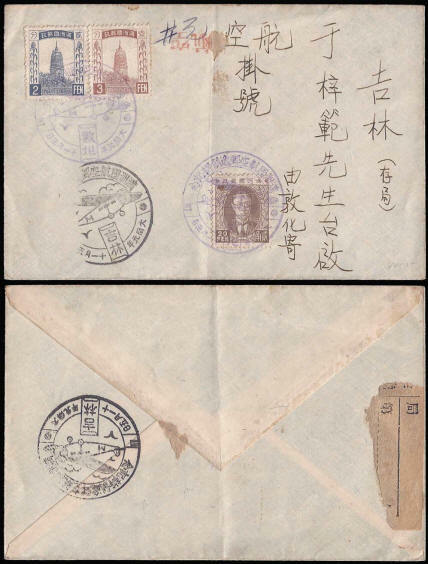 The letter has an inauguration of Air Mail service commemorative cancellation (Zirkle 2 - dated 7th November 1932) and a MATC (Manchukuo Air Transport Co) "Air Mail" label. 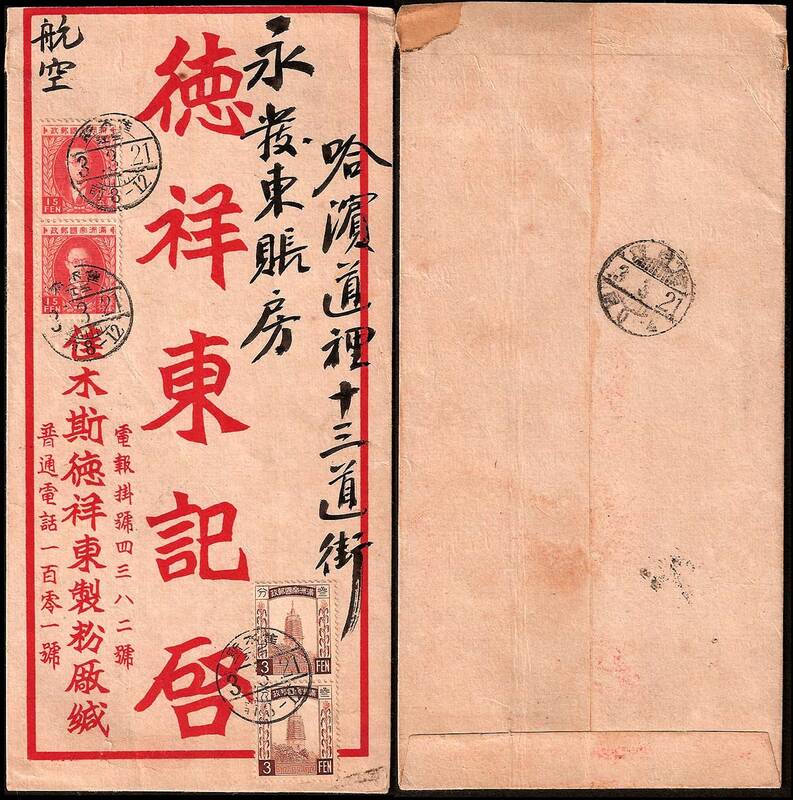 The cover was sent from Tsitsihar and the delivery address is shown as Tokyo Central Post Office. This was probably part of a special batch of such covers sent for sale to collectors. Above is a Japanese souvenir postcard celebrating the inauguration of the Japan-Manchukuo Airmail Service. 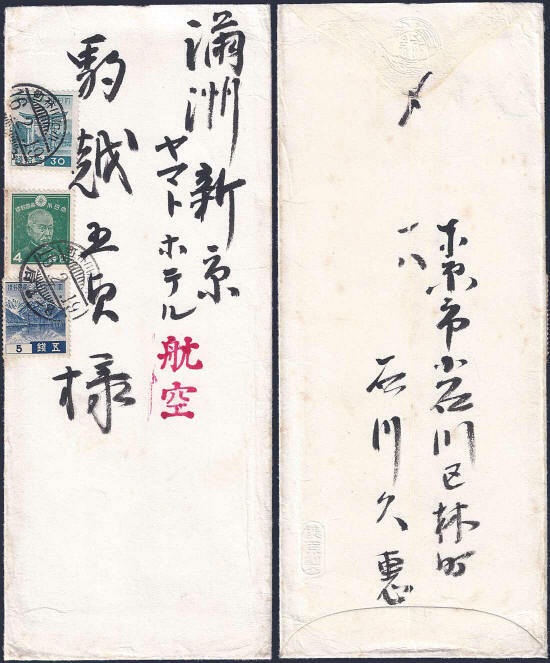 The card carries a Japanese 1½ sen stamp, the domestic postage rate, with a special cancel designed to commemorate the service. The cancel which is from the post office at Osaka in Japan is dated 3rd November 1932, the date upon which the service started. The card also features a picture of the Fokker Super-Universal aircraft registration M104 used to provide the service. The card was supplied in a special envelope, to see that click here. 1st February 1933. 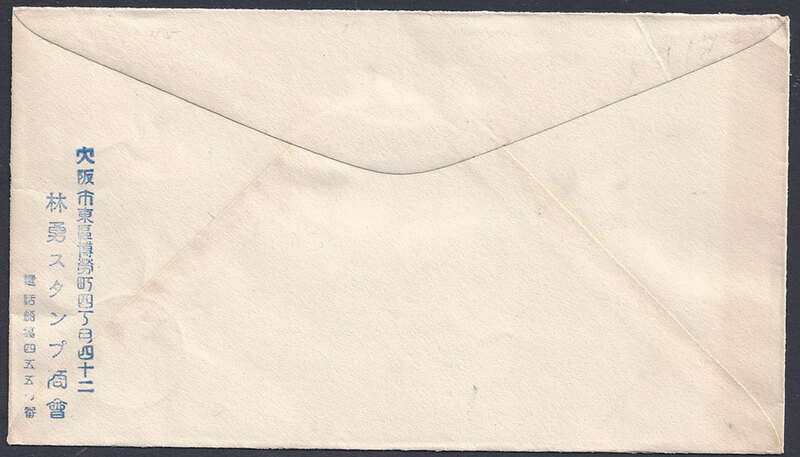 This is an airmail envelope supplied by JAT. 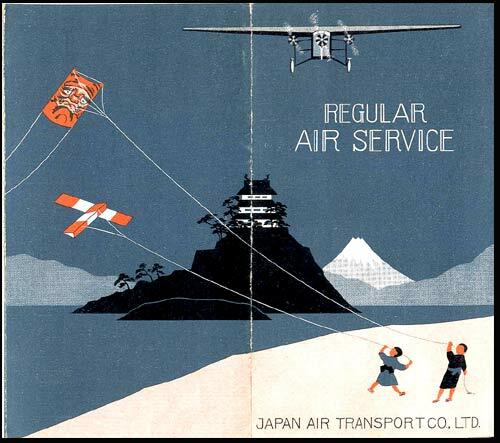 Japan Air Transport Company Limited 日本航空輸送株式会社, Nihon Kōkū Yusō Kabushiki Kaisha was the Japanese flag carrier of its day and instrumental in setting up Manchukuo Air Transport Co. 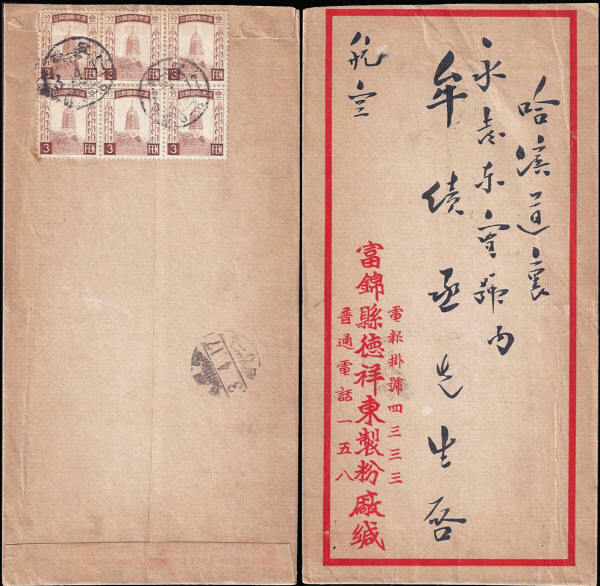 The cover above is postmarked 1st February 1933, 黑龙江省 Hei Long Jiang province (Heilungkiang), 齊齊哈爾 Qiqihar (Tsitsihar) it also has a boxed Airmail hand-stamp. The stamps are both from the first general issue 4f letter rage + 15f for airmail. 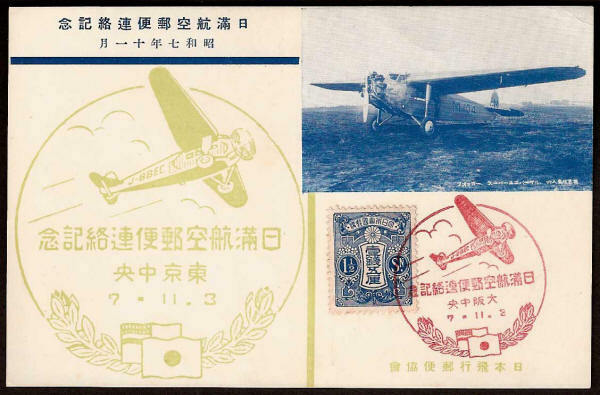 A pencil note on this cover seems to suggest that the first flight from Tsitsihar to Dairen took place in March 1930. Dated 21st December 1934, the cachet shows the Fokker Super-Universal M-106 above the Harbin Russian Orthodox Cathedral, Saint Sophia. The purple cachet is typical of a First Flight cachet and may have been designed to celebrate the new route to Hsinking which opened on 9th November 1934, a similar cachet appears on the cover below. Airmail was gradually rolled out across the country and not all major cities offered the service in the first year - 1932. Farquhar shows a copy of the airmail routes dated September 1934, this included Harbin,. The card depicts the Manchukuo Monument at Harbin Station. This card may have been sold at Harbin station as a souvenir. 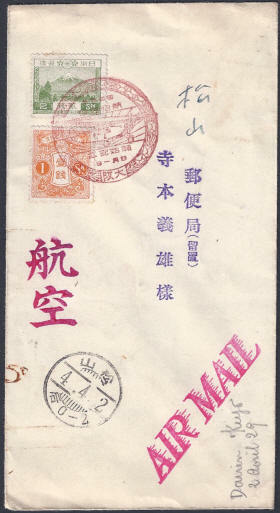 1½ fen was the normal Domestic, China and Japan postcard rate in December 1934. To see the reverse of this postcard click here. 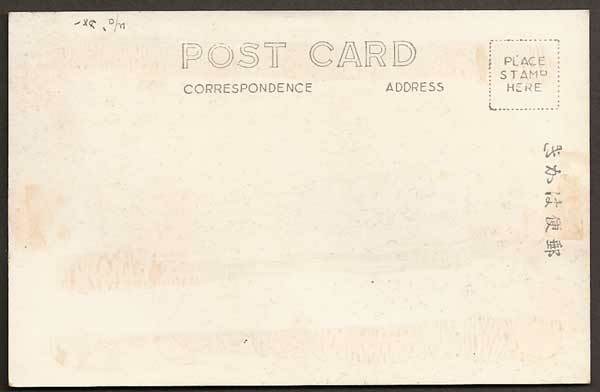 In this instance the postage would not have been sufficient for an airmail postcard had it been addressed. This may be a first flight cover signified by the special cancel. The address 郵便局留置 means Postal Bureau Custody so it is possible that this is part of a batch of sealed covers sent for sale to collectors. The postmark is a Harbin International dater for 9th March 1935, presumably new routes were being established at this time. There is also a carefully applied M.A.T.C. label. There are two cachets showing aircraft, the first has Manchukoan dating (year date 2) the second has Japanese dating (year date 10). The postage is correct at 18f. 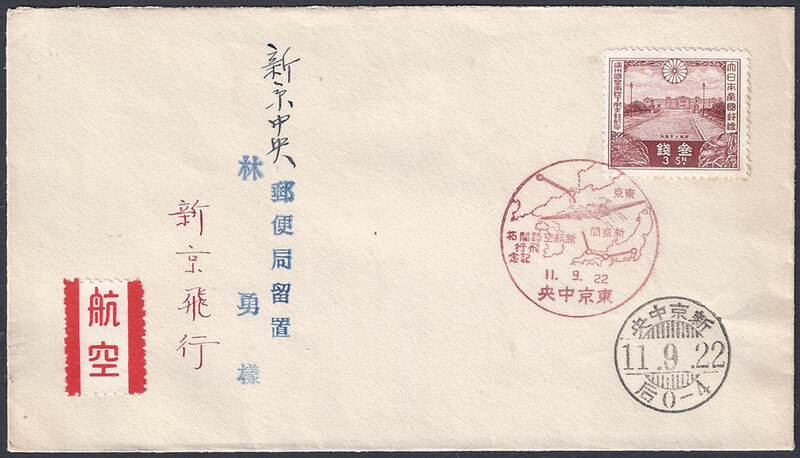 The city of Dairen benefitted from the Manchukuo domestic airmail rate and the above cover is proof of this. Elsewhere in the KLT the airmail rate would have been 24f at this time. The use of J.A.T. stationary may mean that it was aimed at Japanese collectors. This is a first flight cover signified by the special cancel. The address 郵便局留置 means Postal Bureau Custody so it is possible that this is part of a batch of sealed covers sent for sale to collectors. The Mukden International postmarks have been carefully applied as has the M.A.T.C. label. The fact that Dairen has be written on the cover may indicate that these covers were also sent to post offices at a variety of other destinations. The reverse of the cover is shown here. The postage is correct at 18f. The city of Dairen benefitted from the Manchukuo domestic airmail rate and the above cover is proof of this. Elsewhere in the KLT the airmail rate would have been 24f at this time. This is an Airmail cover sent from a flourmill in 佳木斯 Kiamusze (Jia Mu Si) to a shop in Harbin. 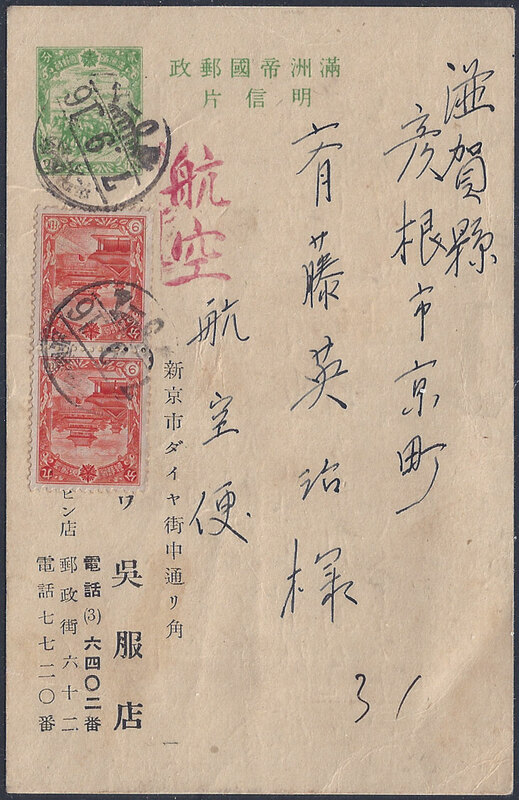 The letter was posted on the morning of 21st March 1936 and the arrival postmark indicates that the Harbin Post Office received it on the afternoon of the same day. The postage is correct for a double weight domestic letter, ie; over 20g. 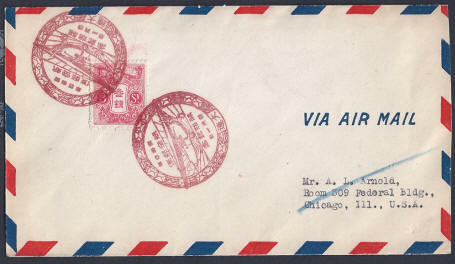 The letter rate 3f plus 15f for airmail x 2 = 36f, the value of the stamps applied. This is a cover sent from 富錦 Fuchin in 三江 Sankiang Province on 17th April 1936 to Harbin. The letter arrived the same day. The postage in the form of 6 x 3f stamps (18f) is correct for an airmail domestic letter at this time. 22nd September 1936. 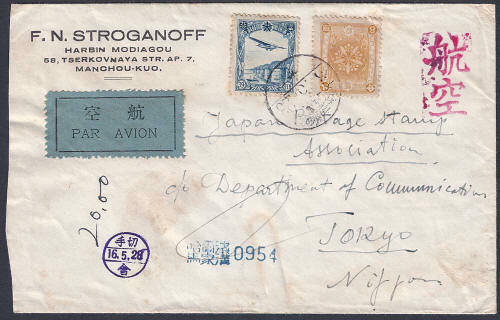 This is a nicely prepared philatelic cover to commemorate an exploratory flight to prove a new mail route from Tokyo to Hsinking. First Flight covers were (and are) prized by collectors and this falls into that category. This was an exploratory flight from Tachikawa airfield in Tokyo to Hsinking. The aircraft used was a Mitsubishi Ki-2-11 modified to carry extra fuel and belonging to the Asahi newspaper company. The non-stop 2,000km flight was completed in 9 hours and 10 minutes. The intermediate places marked on the route represent navigational way-points. The aircraft was named Otori (fabulous bird), it made several record breaking long distance flights between 1936 and 1939. 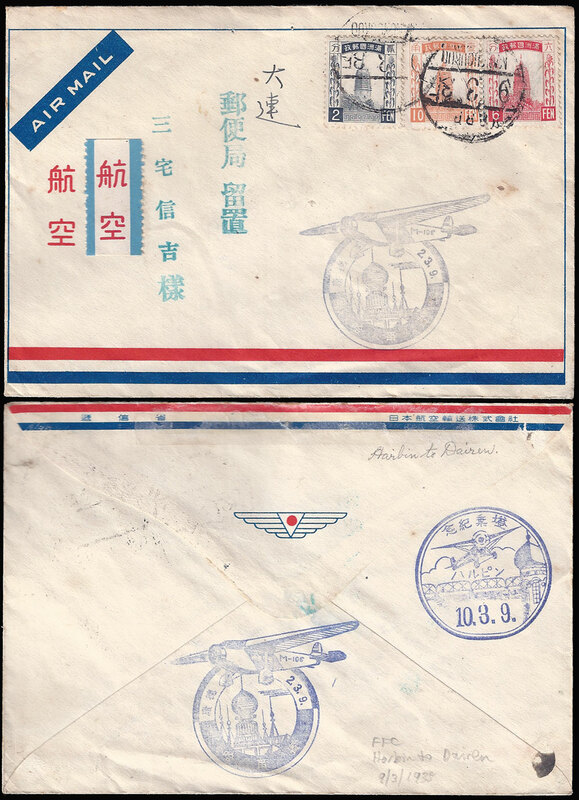 This cover has a carefully placed Japanese airmail label and a special first flight cancel showing the new route, issued by Tokyo Central PO. The red commemorative cancel is a Small Circular Date-stamp (SCD) a valid postmark which had to be requested at the post office by the customer. Only three PO's issued this cancel Tokyo, Tokyo Central and Tachikawa, all in Japan. The date in both cancels is 22.9.11 using the Japanese era date, this must have been done by special arrangement as in Manchukuo the date would normally have been shown as 22.9.3. The Hsinking Central PO arrival cancel has been cleanly and carefully applied and shows that the cover arrived before 4pm in the afternoon on the same day as it was posted from Tokyo. The stamp too was specially selected as the 3 sen stamp, featuring the Akasaka Palace, is part of a set issued to commemorate the visit of the Emperor Kangteh to Japan in 1935. 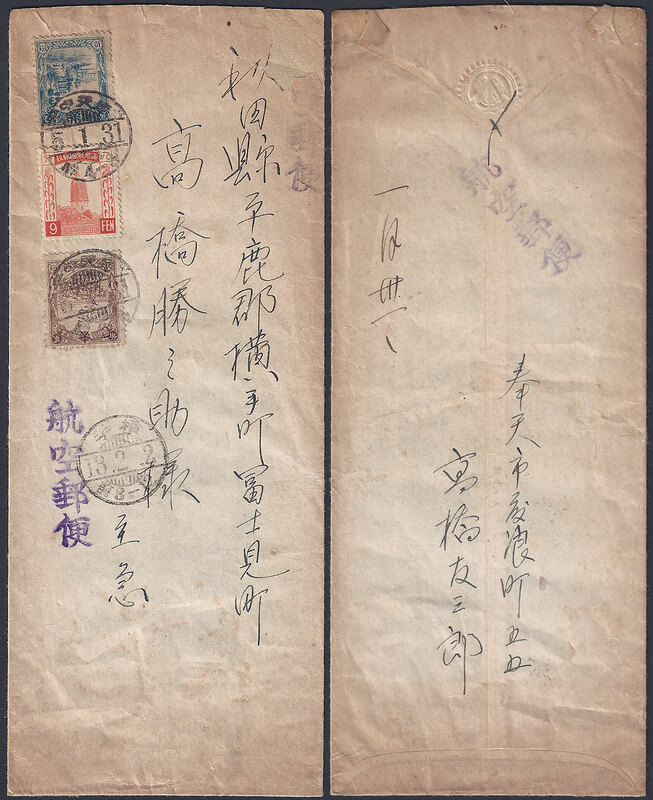 Realistically a postage rate of 3 sen would have been insufficient postage however it is likely these covers were transported by special arrangement for re-sale by the Japanese Post Office. The reverse side can be seen here. This cover appears to have been posted on 2nd November 1937 in which case it has the hard to find first issue of the 39f airmail stamp. This means the 39f stamp is one of only 10,000 to be produced on 14th September 1937 in the first batch and not associated with the the much larger re-print in 1939. 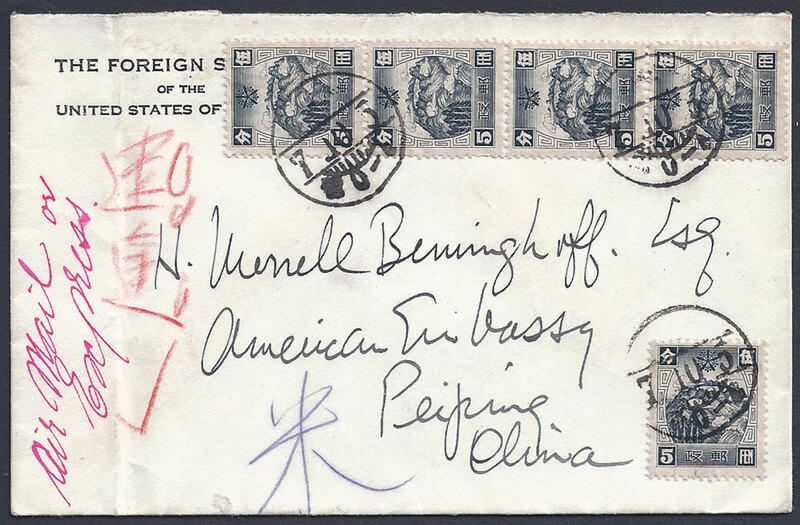 The cover itself is likely to be philatelic as a combined total of 58f is not a standard airmail fee at this time. Finding the 39f stamp on a cover is the only sure way to identify examples from the first issue. This cover entered the postal system from 瀋陽 Shenyang Post Office on the morning of 13th December 1937 and the stamps were cancelled with two domestic postmarks. 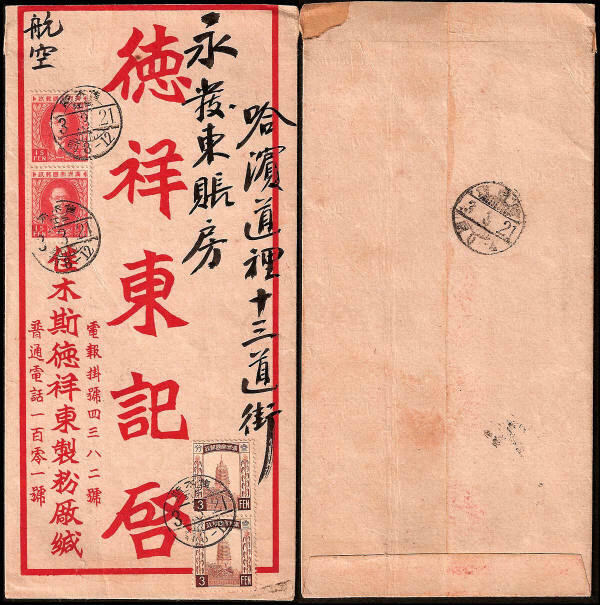 Later that morning the letter was transferred to 奉天中央 Mukden Central Post Office where it received a transit postmark. 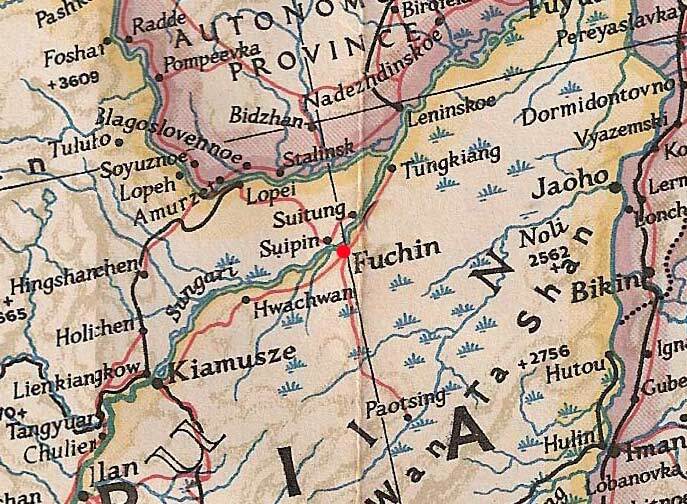 The sender was the Italian Consulate in Mukden. The postage of 39f is correct for this time. The stamps commemorating the ending of Extra-territorial rights had been issued 12 days earlier on 1st December. Transit time unknown. It is difficult to read the handwriting but from the cancel it looks like the letter was posted from Mukden Central P.O. 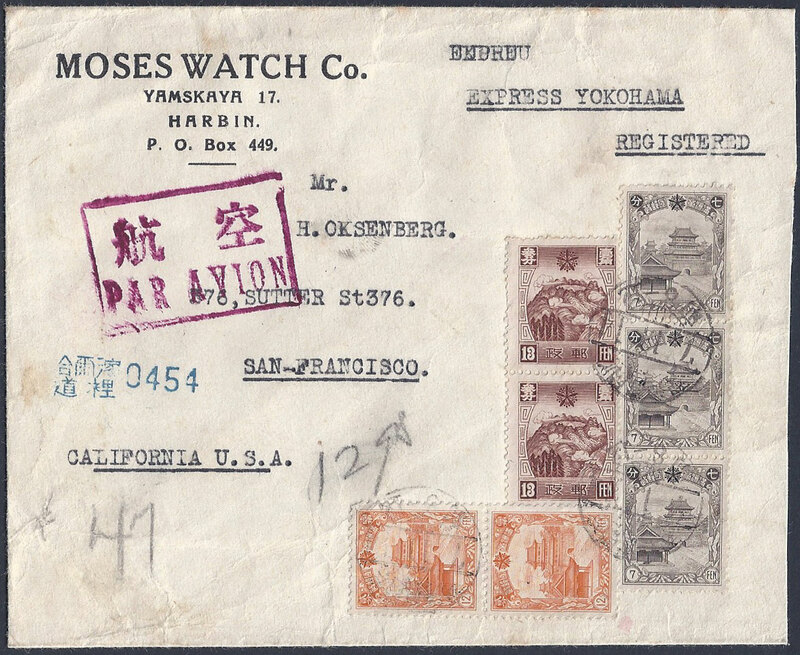 The cover was sent on 31st January 1938 to Japan by airmail. The purple chop reads 航空邮 Airline Post. 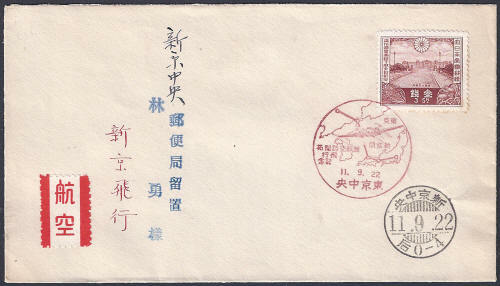 The arrival date-stamp reads 横手 Yokote, in Akita Prefecture, Japan and shows that the letter was received 2nd February 1938 a transit time of 3 days. The postage rate of 39f was correct for that time. 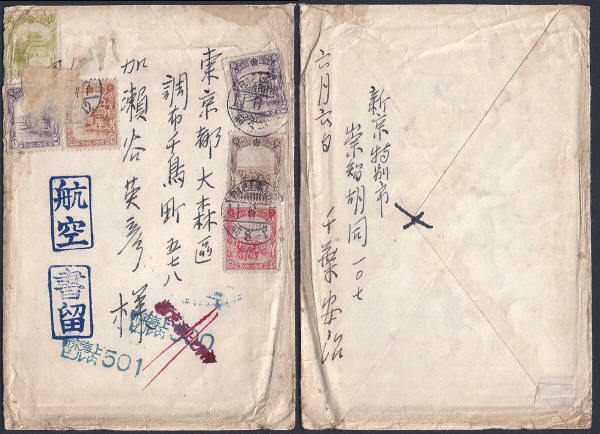 This is a "First Flight" cover from Harbin to Tsingtao dated 25th December 1938. 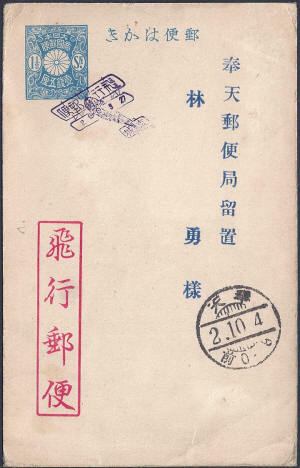 The special cancel reads 満華航空郵便創始紀念 Commemorating the Start of Air Mail Service between Manchoukuo and China. The letter would have travelled as far an Chin-chou with the M.A.T.C. 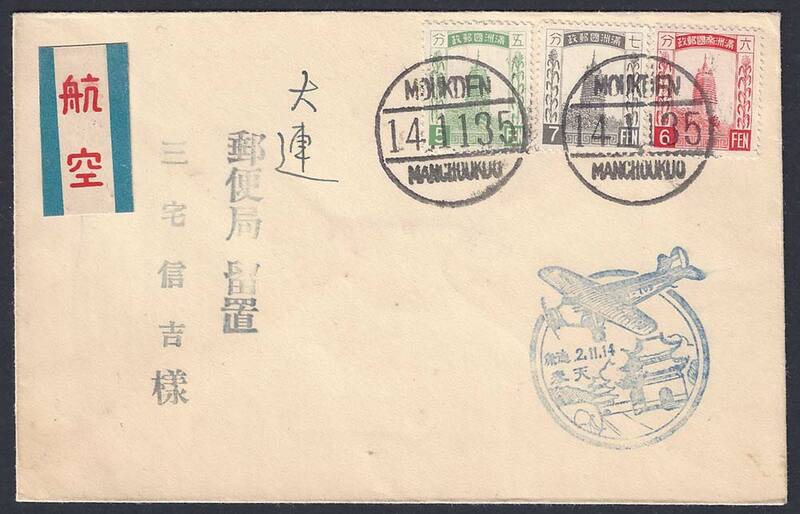 (Manchurian Air Transport Company), and from there the mail was transported by a Chinese carrier. The postage rate of 25f was correct for this time. 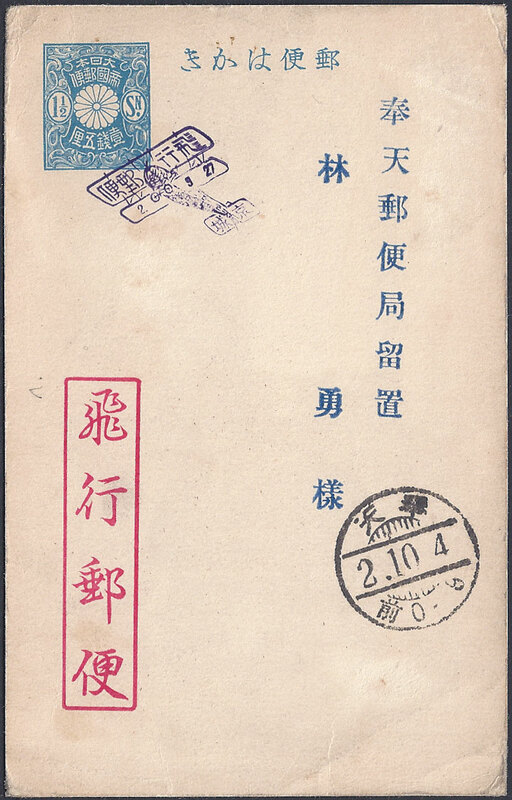 The blue/grey Par Avion label is sometimes ascribed only to Manchukuo, however I have seen examples that pre-date Manchukuo and so these are more likely to be generic to the whole of China and produced by local printers. 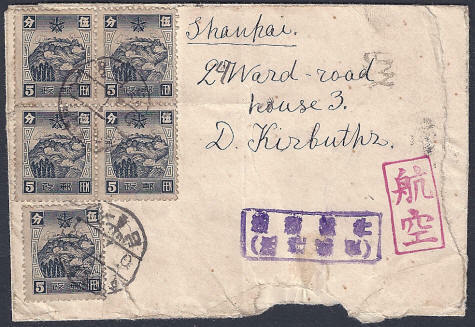 This is an airmail cover to Shanghai posted on 6th January 1939 and on the reverse it shows an arrival cancel in Shanghai for 7th January, a day later. The boxed purple hand-stamp is blurred but reads something like "by the most expedient means". With a one day transit time it seems this request was honored. These two postcard were both sent to Japan by air mail. The first on 16th September 1940 and the second 10th December 1940. The rate of 20f, made up of 2 x 9f stamps and a 10f stamp and 8f stamp added to a 2f pre-paid postcard, is correct for the period 1st April 1937 to 1st March 1942. The cards are marked 航空 indicating that the Air Mail service is required. Airmail postcards are a rarity because they are not usually used for urgent correspondence. This letter was sent on 5th October 1940 to the American Embassy at Peking. The sender was in a hurry and marked the cover "Air Mail or Express" in red ink. The letter went by airmail, had it travelled by Express mail it would have cost 20f, (Letter rate 4f + Registration fee 8f + Express fee 8f). The clerk who had taken the letter to the post office was obviously told to look for the quickest service and this was airmail. This is an express cover from Harbin to San Francisco via Yokohama. 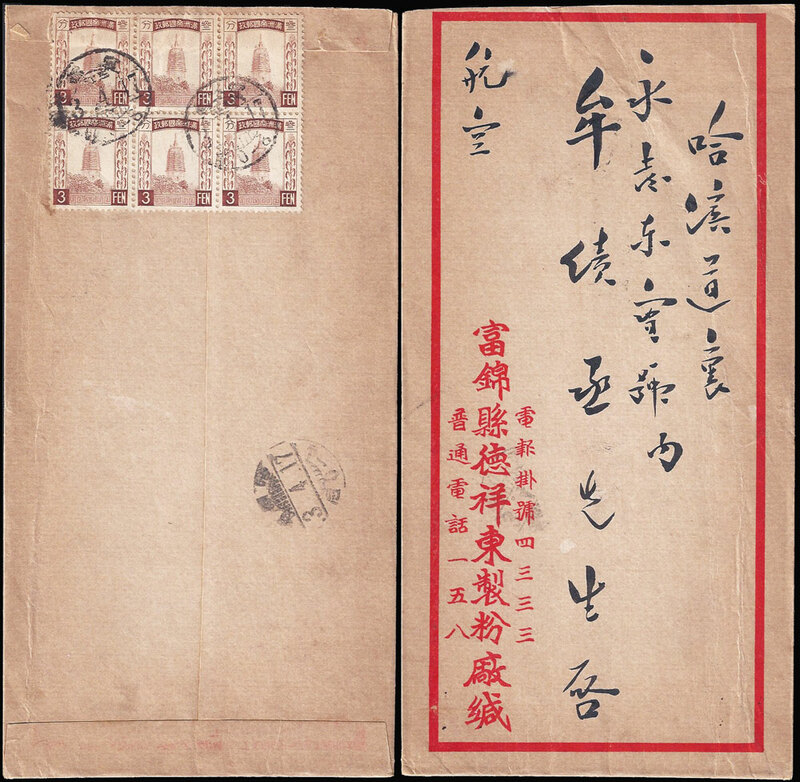 The cover entered the post at 哈爾濱道裡 Harbin Daoli Post Office where it was give the registration number 0451 on 11th November 1940. From there it went, probably by air to Yokohama and on by ship to the United States. On the reverse is an arrival postmark showing that it reached San Francisco on 8th December 1940. A transit time of 27 days which was not particularly quick. 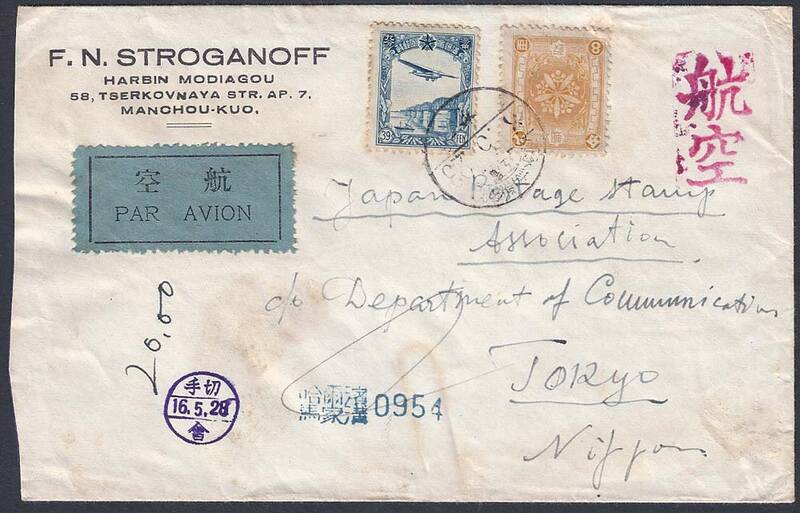 There was no trans-pacific airmail route at this time so airmail could only extend as far as Japan. This being so, the puzzle is to account for the 71f postage. My best guess is that it was sent Airmail to Japan = 39f + registration 16f and then either as printed matter up to 200g = 16f or as a commercial sample up to 150g = 16f from Japan to the USA. Both of these scenarios would give a total of 71f. The 27 day delivery may simply have been due the rough seas in November causing a the slow passage for the post ship.. 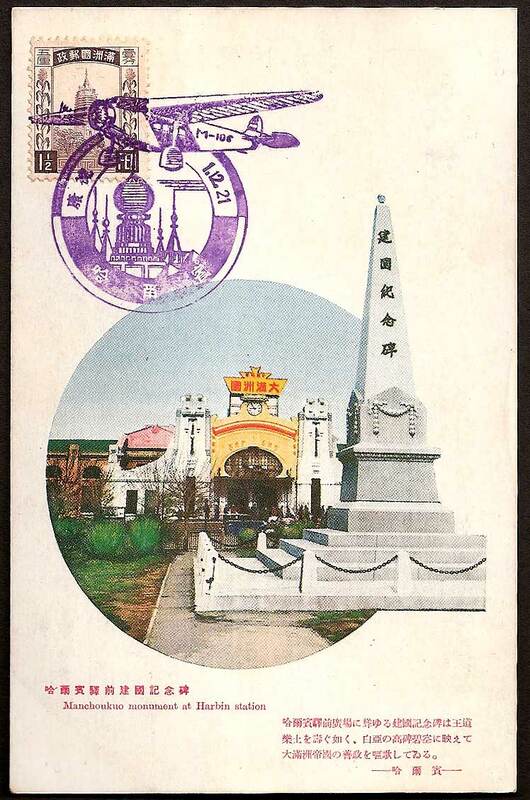 This cover was sent from the Harbin stamp dealer Stroganoff to the Japan Postage Stamp Association in Japan. Majiagou was the Jewish district in Harbin and most of the inhabitants were White Russian Jews including many who were stamp dealers. The postage date is shown as being 23rd May 1941 as can be seen by the cancel. The purple personal date-stamp of the recipient reads 28th May, as the letter was sent airmail it is likely that it reached its destination in no more than three days so the purple date-stamp is not likely to indicate the delivery date of the letter. The postage is correct, 39f for airmail and 8f for registration. 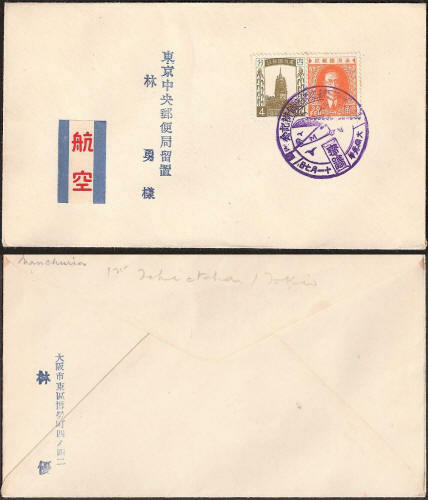 The red postal marking 航空 indicates airmail, while the blue 哈爾濱馬家溝 0954 gives the registration details. 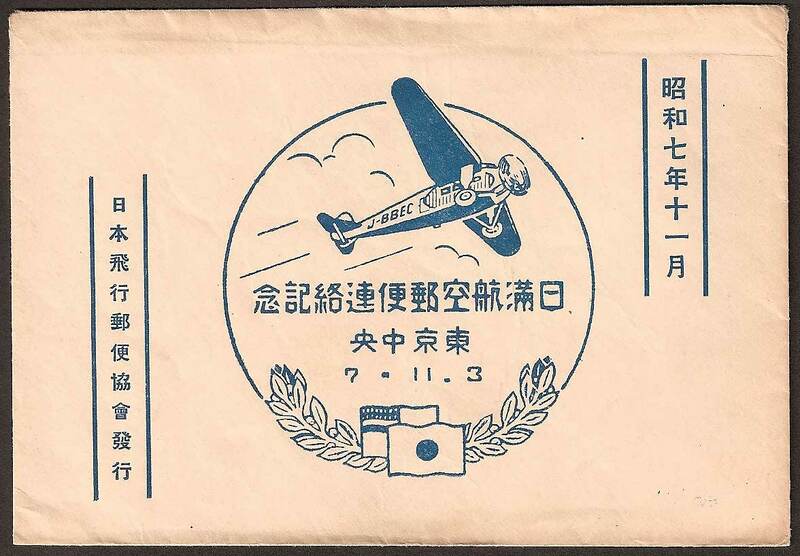 The blue label (unlike the one above) is a good match for Gunter Mair's "Manchukuo Airmail Par Avion Etiquette Label Ref: MCH-A-1" as shown in his Catalogue of Airmail Labels. 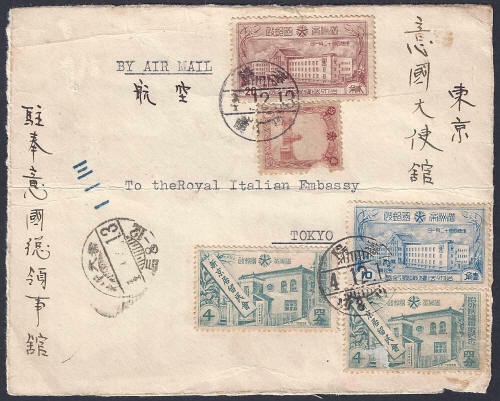 This cover was posted on 19 February 1941 from Japan to the Yamato Hotel in Hsinking. Note that the postage is 39f which is the same price as for airmail travelling in the opposite direction. This is a nice cover but it has a few problems, the biggest of which is a missing stamp that probably came away when the registration slip was removed. I can find no single value that fits with the postage rate table. The cover was sent from Hsinking on 7th June 1944 to Tokyo in Japan. It carries a boxed 航空 "Airmail" hand-stamp and a boxed Japanese style 書留 "Registered" hand-stamp. From the registration number 新京海上ビル内 501 we can tell that it was posted from Hsinking Hai-shang Biru-nei Post Office. The red handstamp used to cross out the incorrect registration number also reads 新京海上ビル.